Your Flue needs to remove all the Harmful fumes your fire gives off so it is paramount that the Flue is Inspected and tested for the effective removal of products of combustion(fumes)and that your new fire is compatible with your type of flue. Brick built (class 1)-Identified by Brick Chimney Stack with Chimney pot on top.Normally they have large chimney breast in living room and usually most open flued gas fires can be installed into this type of Flue. 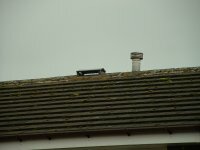 Precast (Class 2)- Identified by Ridge vent on top of roof (raised ridge tile) or may have a metal pipe rising out of roof tiles.Only gas fires suitable for precast flues may be installed they normally have a shallower fuel bed. Prefabricated (class 2)- Identified by metal pipe rising out of roof tiles or run externally up side of the house.Fires normally have shallower fuel bed. Balanced Flue- Where there is no sign of a flue outlet on your roof but a metal pipe exiting out of the back the building behind the fire usually with a metal basket type guard.Fire comes complete with its own flue and and is room sealed (glass fronted)Ideal for properties with no Chimney or flue but need to be installed on an external wall. Fan Flued- Flue similar to balanced flue but flue outlet has fan unit on outside of building. fire is open flued fire bed open to room. Flueless- These types of fire use catalytic converters which turn carbon monoxide into carbon dioxide.A 100cm2 purpose provided air vent must be installed in the room the fire is to be installed. 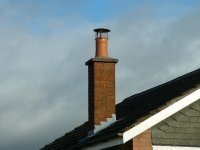 We always recommend having a survey on your flue prior to the purchase of your chosen fire not only the suitability but the quality of construction and current legality as over the years regulations on flues and chimneys have changed and what once was deemed to be satisfactory is now classified as sub standard or not to current standards and work may be required to bring your flue up to current standards. 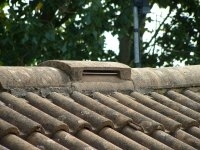 Check out following pages for photos of different flue types.